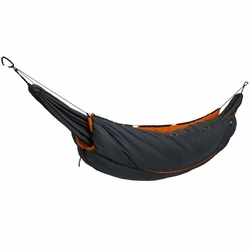 ENO Vulcan Underquilt. For extreme conditions, the Vulcan Underquilt uses Primaloft® Synergy Continuous Filament Insulation for superior warmth, softness and loft. The Vulcan's differentially cut construction adapts to the natural contours of the body, keeping drafts out and comfort levels up. The full length quilt, complete with adjustable shockcord suspension, is thermally efficient, protecting you from your toes to your chin while its DWR finish creates a moisture resistant barrier. Packing down to a travel-friendly size in an included nylon stuff sack, the Vulcan also boasts incredible compressibility. Whether you're in Alaska or the Alps, the Vulcan will keep your love for the outdoors and cold conditions simultaneously alight. Eagles Nest Outfitters.